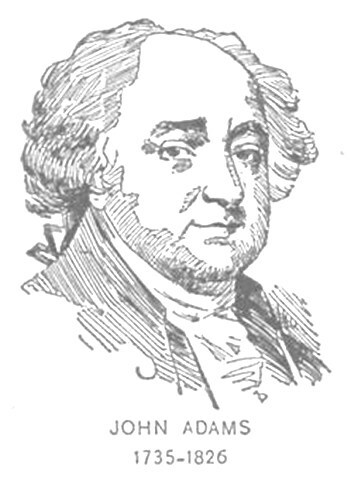 John Adams was born in Massachusetts, the son of a farmer. He enjoyed farming and hunting while he was growing up. His father taught him to read when he was very young, then he attended school and entered Harvard on a scholarship when he was fifteen years old and graduated when he was twenty. Harvard at that time consisted of four buildings and a faculty of twelve. While he was in college he began to keep a diary. It was very small, about the size of your hand. His handwriting was so tiny you would need a magnifying glass to read the words. After graduation he became a schoolmaster. Sometimes he would select a bright student to teach the class, and he would sit back and read or write. He soon tired of teaching and decided to start studying to become a lawyer. When he was twenty-eight he married Abigail Smith, who was his third cousin. She was nineteen years old. They had a long and successful marriage. They had four children. 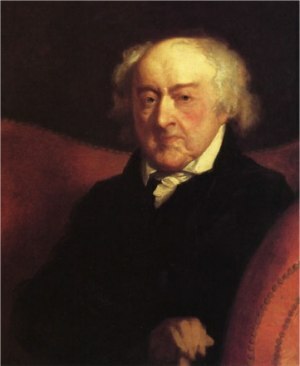 One of their sons, John Quincy Adams, would later become President. Abigail was the first First Lady to live in the White House. John suffered from ill health and at one point moved from Boston back to Braintree (Quincy), Masssachusetts, his birthplace. He then began to commute* to work and spent the rest of his time in the country with his family. What a commute it was! Just think how difficult it would be to ride 400 miles on horseback in the middle of winter. Abigail was left at home to take care of things. The couple was separated a total of about ten years while he served his country. John Adams accomplished a lot. He served in the Continental Congress. He nominated* George Washington to become commander-in-chief of the Army. He also was the one who chose Thomas Jefferson to write the Declaration of Independence. Significantly, he also got Congress to vote for the Declaration. He was very influential* in the early days of America. John Adams was a brave person. When he was asked to go to France to enlist their support for the Revolution, he accepted the challenge. He and his 10-year-old son, John Quincy, braved the ocean on the ship "Boston" in the dead of winter. During the voyage they encounted a hurricane, an enemy ship which engaged them in a battle, and a period of calm waters where the ship could not move. They finally made it, and father and son remained in France for about a year. John Adams served as vice-president to George Washington. During this time he got the Dutch* government to provide large sums of money to finance the Revolution. He wished to be remembered for this act above his other accomplishments. He served one term as President, then went home to Quincy and remained there for twenty-five years until his death. During this time his wife and his daughter both died. John Adams taught himself French during the times he was sailing across the Atlantic. John Adams and Thomas Jefferson had become rivals and his friend became his enemy. John made the first move to reconcile,* and they became friends again. They wrote letters to each other until their deaths which curiously occurred on the same day, July 4, 1826. John Adams was ninety-one years old. Press "Go" to search for books about John Adams. 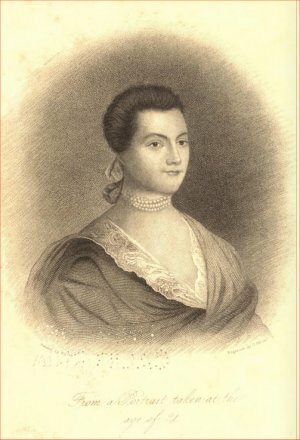 Abigail Adams image courtesy of unforth at Flickr. It would be nice if here was a Samuel Adams link. I didn't find this very helpful in a project I'm doing. It need more information. Good effort though! good info. every time in history we get a paper and we have to come to this website . This page displayed 409,369 times.